Market forces are combining to make supply chain disruption likely across all sectors, particularly in the light of Brexit. To mitigate risk of supply shortfall, businesses are likely to respond by holding more stock in the supply chain, moving away from current Just In Time models. However, this will not be as straightforward as it sounds. There is a well-documented critical lack of fit-for-purpose warehousing close to large population areas. This is essential to serve technology enabled consumers who shop ‘little and often’ for food and other goods and expect same or next day delivery of online orders – a situation which has already been highlighted by UKWA. We are facing a ‘perfect storm’ in the warehousing and logistics industry, with little speculative build in the pipeline, urban development land earmarked for residential but not for the warehousing required to fulfil rising consumer demand, and a severe labour and skills shortage, exacerbated by the ‘Brexodus’ effect as Eastern European immigrant labour heads home. Added to this is the estimated 200 million extra customs declarations that may need to be processed post Brexit. Clearly this will lead to an interruption in the supply chain, and, as half the food we consume is imported, 80 per cent of that imported food comes from EU and 90 per cent of that comes through the Dover corridor, so we expect property investors to be scouring the M20 corridor now because that’s where there’ll be demand. Should “rest of world” rules be applied, new food inspection facilities will be required; and to keep the vital Dover corridor clear post Brexit these may have to be located inland. This is a critical issue for ensuring continuity of food supply throughout the UK. Although evidence for the upsurge in demand in warehousing is largely anecdotal at this stage, activity on UKWA’s dedicated MarketSpace portal tells the same story. UKWA MarketSpace matches supply with demand for available serviced and quality accredited warehouse space by type, size and geographic location. Currently, there are over 150 companies registered on the site, offering warehousing space in more than 200 locations nationwide. In the last quarter of 2018 we saw a spike in new visitors coming to the site, with 90% visiting for the first time and most going straight to the ‘Search for Space’ facility. There has also been a marked increase in visitors coming from outside of UK, particularly from US, Canada and China, as well as additional new visitors from France, Germany and Poland. 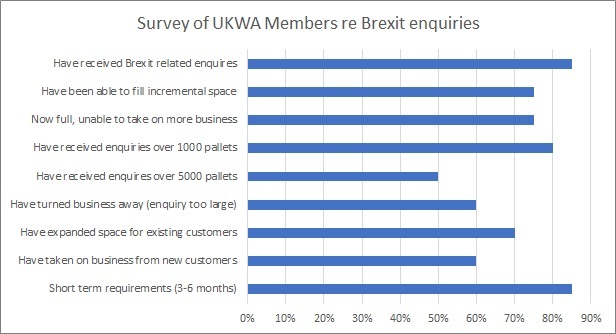 In a straw poll of UKWA members conducted in December 2018, 85% had Brexit-related enquiries, mostly for short term requirements. 75% of those surveyed had been able to fill incremental space but were now full and unable to take on any more business. The survey was nationwide from Kent to Fife, with enquiries across a wide range of commodities – packaging materials to cat food, some food ingredients, components for manufacture, finished consumer goods etc. UKWA is also supporting a government initiative, outsourced to Ipsos Mori, to evaluate warehousing capacity in the UK, particularly that which is currently customs approved (for inland clearance of goods), and/or is not currently approved but could be so in the future. The logistics industry is the enabler of international trade and the view from our industry is that the prospect of a ‘no deal’ Brexit is catastrophic. We recognize that the withdrawal agreement on the table is not perfect, but it does allow us to move ahead towards transition out of the EU. We believe, along with most business leaders, that MPs should put aside dogmatic, entrenched positions and abandon political jockeying, instead putting the future of our country – and our economy – first.